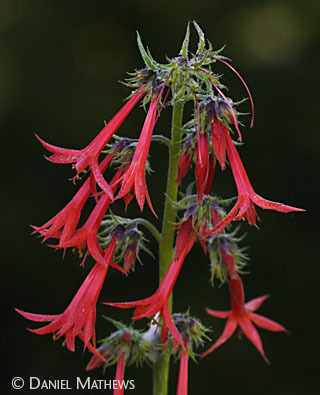 Corolla scarlet, trumpet-shaped, the slightly flaring tube twice as long (½–1¼”, or 12–30 mm) as the 5 slightly recurved, pointed lobes; 5 stamens borne near mouth of tube; leaves both basal and on stem, much-dissected, the lobes linear; stems to 3′ [90 cm], many-flowered, or dwarfed (4″, or 10 cm) at high elevations. Habitat: Dry meadows, forest openings, scree, from low to mid-elevations; e WA, OR, ID, MT, WY, and Columbia Mtns in BC. Natural History: The long tubular corolla and bright red color are clues that this flower evolved with hummingbirds as pollinators. Most insects cannot see red, but hummers seek it. From the Wind River valley south, many skyrocket flowers are not scarlet but white or light pink, perhaps with red speckles. 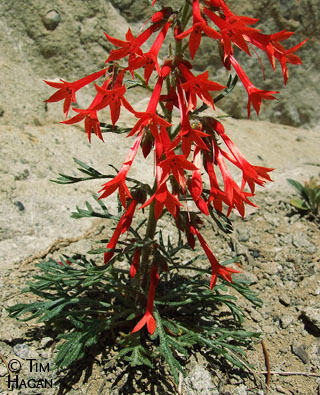 In some populations the same hillside—or even the same plant—switches from red blooms in July to pale ones in August. This happens where hummingbirds migrate through and are gone by August, leaving white-lined sphinx moths as the best available pollinators. At night, the moths don’t see red flowers very well, and mainly visit white flowers. The plant lives as a rosette of leaves for two to five years before producing one flowering stem and then dying.